My name is Yedida and I have the privilege of managing the Tauber Holocaust Library and Archives at the Holocaust Center. What is an archive? Theoretically, an archive is anything that you store, or a place where you store it. Our archive traces the journeys of Holocaust survivors and their families who ultimately settled in the Bay Area. Please join me for an exclusive tour of the Tauber Holocaust Library and Archives and follow me behind the scenes of a typical day at the office. 10:00 am: I arrive at the Holocaust Center with my faithful dog Bella, archivist-in-training. Running and caring for an archive requires many hands. For this reason, the Tauber Holocaust Library and Archives is fortunate to be a program of Jewish Family and Children’s Services (JFCS) in San Francisco. The JFCS Facilities team helps us maintain optimal conditions for archival preservation and JFCS Tech Support ensures backup and security for our digital collections. You may notice a purple theme as we enter the Holocaust Center. It’s our favorite color! 1:00 pm: A personal tour – the archivist as educator. 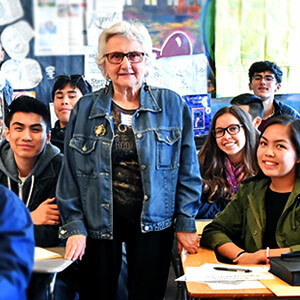 As our Holocaust survivors are aging, primary sources—documents, artifacts, photographs, oral and written testimony—are becoming ever more central to Holocaust education. Today, Lucy and her 11-year-old daughter Christine are visiting San Francisco. They stop in for a personal tour of the archive. I show Lucy and Christine a passport belonging to Max Mandl, a Jewish businessman from Germany. 3:00 pm: Summer intern Jack D. boxes up VHS tapes for storage. We all have stories. Bella Dog, our archivist-in-training, was rescued from a shelter at age 10. I came to the Bay Area from the East Coast five years ago as a history Ph.D. Our summer intern, Jack D., has a background in religious studies. Listening to the stories of others is one way to increase understanding, mutual respect, and tolerance. 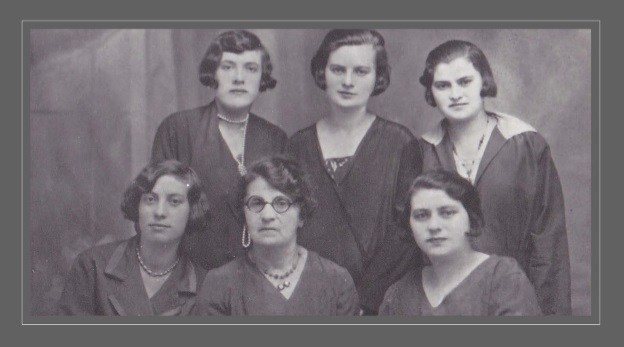 Our oral history collection has preserved the stories of Bay Area Holocaust survivors in all their diversity: emigres, camp survivors, hidden children, and others. The majority of these 2,000 interviews were originally taped on VHS. Several years ago, the University of Southern California Shoah Foundation undertook the task of digitizing the oral history video tapes. The testimonies were then indexed and added to the Shoah Foundation’s Visual History Archive (VHA). The Holocaust Center has recently joined a select group of 85 sites around the globe with full access to all 55,000 testimonies in the VHA. Pretty neat, huh? Now that our oral histories can be viewed worldwide through the VHA, we are moving the original VHS tapes to an off-site facility. Thanks for the hard work, Jack! 5:00 pm: Finding our roots. Over the past 20 years, archives have become easier to access and have come to include an array of voices and stories. For example, take the family history of Howard Schwartz, who has come in this afternoon to view a “yizkor book.” Yizkor books, or memorial books, record the history of Jewish life in East European towns and document the obliteration of these communities during the Holocaust. Since yizkor books often mention or list the names of community members, they are a useful source for genealogists. Most yizkor books were written in Hebrew or Yiddish, and since I read both of these languages, researchers frequently make appointments to peruse the collection with me. Howard Schwartz is interested in the yizkor book from Mlynov, Poland. He already knows a bit about Mlynov from the work of David Sokolsky, the step-grandson of a survivor from the town. In an article that Howard later shares, he recounts how he eventually met with David, and how the two discovered that Howard’s great-grandmother, Yetta Schwartz, knew David’s step-grandmother, Liba Tesler, when the two were in Mlynov. A photograph printed in the Mlynov yizkor book shows the two women together. The Tauber Holocaust Library and Archives provides a space to interact with the past in the present. In documenting the history of the Holocaust and remembrance in the Bay Area—a history with universal implications—we seek out a wide range of voices. May we continue to connect peoples across time and space; and across different traditions and cultures.